The moment something feels like a ‘chore’, we already feel those strong, negative feelings towards it. That sense of dread that you know something needs to be done but you just can’t be bothered to do it, especially if it’s something that is meant to be consistent. We’ve all been there at some stage in our lives, even me! so there’s no point in denying it! 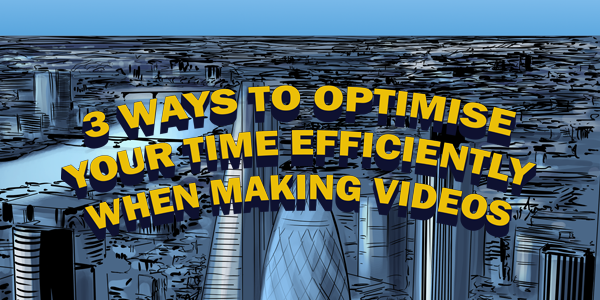 The thing is, as much as it may feel like an effort to produce videos and release them regularly, there are a few things that can make your life easier. So here are three things you can do to optimise your time and make it less of a drama. When the moment comes to make a video, I can bet the first question that pops into your head is “what video should I make?”. Being unprepared for that moment can mean 1: you make a video that your audience wont necessary be interested in, 2: your video won’t make sense, 3: will be lacking correct knowledge and research and 4: a combination of all these will be more damaging for your reputation than beneficial. Consider asking your viewers in advance what content they would be interested in seeing. Look at what is currently trending in the world or ‘hot’ in the search engines to guide your content in a way that will bring in viewers regularly and keep them engaged. On top of this, practice your content. Make sure all your facts are straight and rehearse your content so when the time comes to film, you reduce takes and maximise the number of videos you want to make. Usually when I film with clients they get themselves into what’s known as ‘Flow State’. This means that during filming they become ever present in the moment that their knowledge and wisdom freely flows as they present themselves on camera. It all sounds very mumbo jumbo hippy-like but it’s this state of mind that really brings out the professionalism look in a video. No distractions, just full on concentration on the content they want to share. So now you’re wondering ‘what’s the problem here then? The problem is that people plan to make too few videos in one go. Once they finally get themselves into a state of flow, they claim they’ve completed all the videos they wanted to do for that week! This issue with this is the challenge and effort for next week to get back into that flow state. Instead, I recommend to make the months worth of videos within a day or two or as much in one go as possible. Film as many as possible when in flow state. Not only again will this cut the likely number of takes to make these videos, but also there is no concern or rush to make videos next week, or the week after. This extra time that’s been created can give you the time to research the market, quiz your viewers on what they want next month and have plenty of time to prepare for it. As an extra tip to make your videos look as though they have been filmed over a period of time rather than all in the same day, bring a change of outfits to your filming location and in every other video, change the clothes you wear. As long as you don’t tell your audience, this will be our little secret. It can become an effort to remember to come back to your social medias and release your videos at a desired time every week, and in some cases every day. What if you’re not near a computer? what if you overslept? what if you completely forgot about it? what if you don’t have the time to release it that day? All of these little excuses can be completely removed with a simple feature that every social media (as far as I’m aware of) has, the ability to schedule content. All you need to do is dedicate the necessary time to upload all your videos altogether, do all the meta tagging and descriptions in one go, then schedule a release time and date. The great thing with this is how your content will be pipelined out without you needing to get involved thereafter. So if you didn’t have the time or perhaps you go away on holiday for a few weeks, you can be rest assured your content is going out regularly to your audience and the consistency is as strong as it ever will be. So there you have it, prepare your videos in advance to make stronger, better videos in less time, make a month’s worth of videos when you’re in flow state and schedule your videos on social media so you can go on more holidays. Need a consultation or Youtube advice? I’m here to help!